How do massive clusters induce peculiar velocities in the Hubble flow? What is the Virgocentric infall velocity of the Local Group? What is our expected velocity towards the Coma cluster? What is the magnitude of our motion towards the Great Attractor? Why are bulk flows coherent over the sky? How does gravitational collapse battle with Hubble expansion to determine clusters and void regions? from the energy equation for a spherical distribution of matter in a uniform background? What are the 3 cases for a universe (or patch thereof) corresponding to k = 0, < 0, and > 0? What is the fate of a critical density Universe? What is a "bound" universe like? What is the critical density for our universe, for H_0 = 60 km/s/Mpc? How does the density evolve with the scale factor R? How is the scale factor R related to the redshift z? What is the deceleration parameter? What is the dynamical equation for a universe with the critical density? What is the time element dt in terms of dR of the scale factor? How does the time t scale with R? What is the current expansion age t_0 in the k=0 universe? What is t_0 for H_0=60 km/s/Mpc? How does this compare with globular cluster ages? How does the Hubble constant H(z) evolve with scale factor? What is the lookback time to z = 5 (the most distant quasar)? What do we mean by Friedmann Robertson-Walker (FRW) cosmologies? How does the matter density scale with R? How does the energy density u of radiation scale with R? How does the blackbody temperature T of radiation vary with z? What do the solutions for k < 0 and k > 0 look like? Why does a k > 0 universe recollapse? What are the two major assumptions in the cosmological principle? What besides homogeneity and isotropy might one invoke for the Universe, but we haven't? What is a steady-state universe model? What is the invariant space-time interval ds^2 in special relativity? What is the role of the speed-of-light c? How does the presence of mass affect spacetime in general relativity? How is gravity related to curvature? What is the Robertson-Walker metric for homogeneous and isotropic spacetimes? How is k related to the curvature? How do flat, postive and negative curvatures manifest themselves in 2-D? Which are spheres, saddles, and planes? How does the circumference of a circle measure curvature? What are non-Euclidean or Riemannian geometries? What do we mean by flat, open, and closed universes? Which universes have a finite volume, and which infinite? What is the curvature scale R of an FRW universe with H_0? How does the density parameter Omega vary with scale factor? Why can we consider only a flat universe when calculating things at large z? Astrophysicists are also engaging in large numerical simulations of how we think the universe would evolve under different assumptions about the matter therein. Some of the faculty in this department are involved in these endeavours. Check out some of the links to our work, and other related projects. Because the laws of physics are mathematical, two systems that follow similar laws will behave similarly. We used this when we computed the orbits of electrons about the nucles, noting that the electric force law was similar to the gravitational force law. If you remember when we calculated the energy levels of the atom and when we calculated the escape velocity from a gravitating body, we used an energy equation. Can we make an energy equation for the Universe? which no longer depends on R! This density, 3H^2 /8Pi G, is called the critical density of the Universe. If the average mass density in the Universe is equal to or less than this, then the Universe behaves as if it is unbound and it will expand forever. If the average mass density of the Universe is greater than the critical density, then it will expand to a maximum scale length, then recollapse, behaving like it is a bound system. The case with a density greater than critical gives as a closed universe with positive curvature, finite volume, which will expand for some time, then begin to recollapse. The case with a sub-critical density corresponds to an open universe with negative curvature which will expand forever, and is infinite in volume. A universe with the critical density is flat, infinite, and will expand forever though slowing down toward zero at infinite time in the future. The question of whether we live in an open, flat, or closed universe is a matter of what the mass density of the Universe is relative to the critical density 3H^2 /8Pi G. For a Hubble constant of H = 82 km/s per Mpc as measured by HST, the critical density is 1.26 x 10^-26 kg/m^3. This seems really tiny, but space is really big. (Q: What is this critical density in units of solar masses per cubic Megaparsec?) In fact, it appears that our Universe may have only about 30% of the critical density, and we might be living in an open universe. On the other hand, this is a hard measurement to make, and there are some indications (as well as some theoretical prejudices) that we live in a flat (or very nearly flat) Universe. Note that R_0 = R(z)( 1 + z ) is the redshift relation for light of true wavelength R(z) emitted at redshift z and observed here as an increased wavelength R_0. This is true for any curvature Universe on small enough scales, since it just involves the local expansion rate. What can we "see" about the Universe? It is certainly apparently very large, as the most distant quasars (at z = 5) are over 4000 Mpc away. It appears to be in the process of uniform expansion, with the Hubble relation v = H d. Finally, on the largest scales it appears to be approximately homogeneous and isotropic as per the cosmological principle. It turns out from these considerations alone, and using Einstein's General Theory of Relativity, one is led to some concrete predictions for the evolution and topology of the Universe as a whole. This is subject of cosmology, the study of the Universe as an entity. Soon after the publication of his General Theory of Relativity in 1916, Einstein applied his equations of gravity to the Universe as a whole. However, when he did so he ran into a problem: the equations predicted a Universe that was in the state of expansion or contraction, but not stasis. Remember, this was in 1917, before the discovery of the expansion of the universe by Hubble in 1929, and the philosophical prejudice was that the Universe was unchanging, static, and perhaps everlasting. (Q: Compare this prejudice to those of pre-Copernican cosmology and of pre-Darwinian biohistory.) Einstein found he had to add a new term to his equations, the so-called cosmological constant, to end up with a static universe neither expanded nor contracted. When Hubble discovered the expansion of the Universe in 1929, Einstein found that his equations without the cosmological constant made sense. He then declared that the cosmological constant was his "greatest blunder". He felt that he should have had faith in the predictions of his theory, and disregarded the unfounded (that is, not based upon observation) prejudice for a static universe. However, in the last decade, a number of observations of the Universe have been found to be at odds with some theoretical predictions using simple cosmologies. Some solutions to these problems involve the introduction of a cosmological constant term into Einstein's equations, though in a somewhat different manner than for a purely static universe. Thus, this may not have been a blunder after all! Just like spacetime is curved by the presence of mass like a black hole, the spacetime of the Universe as a whole is curved by the presence of mass (like ourselves). There are three generic topologies for a homogeneous and isotropic Universe with 3 spatial dimensions like ours. They are distinguished by the curvature. In one dimension, like a line, there is only one sense of curvature. However, in two or three dimensions, curvature has a sign, and is positive, negative or zero. For a homogeneous and isotropic, both the sense and magnitude of the curvature must be uniform, that is the same everywhere. It is easiest to use a two-dimensional analogue to begin with. A sphere has positive curvature. In two orthogonal (perpendicular) directions, the curvature is in the same direction, so a positively curved space closes back on itself, like a sphere. A positively curved space is unbounded, but finite (like the area of a sphere). A plane has zero curvature, and is thus flat. Flat space is unbounded and infinite. A saddle has negative curvature. Orthogonal directions show curvature in opposite directions (upward or downward). A space with negative curvature is unbounded and infinite. Note that geometery as we are first taught it is only good in flat space. This is Euclid's geometry, and thus flat (zero curvature) space is also called Euclidean. (Note: flat space is Euclidean, but flat spacetime is Lorentzian, because time behaves differently than space. See the Special Lecture on the speed of light for more details. There are several things that are different in non-Euclidean spaces, and can be used to tell if you are in curved or flat space. For example, one of Euclid's postulates is that parallel lines never meet (if they are not identical). Note that in positively curved space this is not true! Two parallel lines on a sphere are great circles, and two distinct great circles meet on opposite sides of the sphere at two points. The circumference and area of a circle, and the sum of the vertex angles of a triangle are also different in differently curved spaces. Of course, the Universe is very large, and its curvature slight, so you would have to use very large circles or triangles to do these tests! If we live in a Universe that is expanding with mass in it, the expansion is slowing down. Thus, the Hubble constant H was higher in the past when the Universe was expanding faster. We denote the current value, which we measure around us locally, as H0. H0 as measured by HST is 82 km/s/Mpc, though different measurements give values in the range 40 to 100. A universe with higher density is younger than a universe with lower density, given the same expansion rate H0 now, since it will have slowed down more from a higher expansion rate earlier on. This represents the maximum age of an expanding universe with a given current value of H0 (though we will find we can change this by changing the energy equation). For H0=50 km/s/Mpc, the age of an empty universe would be just under 20 billion years, and thus for H0=82 it would be around 12 billion years old. Since the oldest globular clusters seem to have ages of 15 to 18 billion years, then we might expect that H0 would be near 50. Thus, the HST value of H0=82 is incompatible with old globular clusters even for an empty universe. Perhaps astronomers are mistaken about the globular clusters ages (new calculations are being done for stellar evolution). Another possible solution, using a cosmological constant, will be discussed in the next lecture. so for H0 = 50 km/s/Mpc the age t0 is 13 billion years, and for H0 = 82 is 8 billion years! This is the so-called age problem in cosmology, and we are working very hard to see what the solution is. To summarize, the oldest globular clusters appear to be 15 to 18 billion years old, while the Sun is around 4.5 billion years old. If H0 is really as high as 82 km/s/Mpc, and the Universe were flat, then the Universe would be younger than its oldest stars, which is nonsensical. Either we have gotten the globular cluster ages wrong, or H0 is really 50 km/s/Mpc or smaller, or there is some other term in the energy equation that is making the Universe expand faster now than in the past. These give the age of the universe t at redshift z. Thus, at some point in the past the two were equal, Umat=Urad. This occurs at 1 + z = u_mat(0)/u_rad(0). Currently, the energy of the Universe is matter dominated with Umat/Urad around 10^4. Thus, at a redshift z of around 10^4, the energy density in matter and in radiation were equal. Before this, at higher redshifts, the Universe was radiation dominated with most of the energy in photons! The Universe was hotter and denser in the past. This statement turns out to have profound consequences, and follows from the expansion of the Universe and the theory of relativity. In fact, if we carry it to its extreme, there must have been a point (as it turns out not infinitely far back in time) when the universe was infinitely dense and infinitely hot - this is the point called the "Big Bang". This fiducial beginning is the point from which the age of the Universe is measured. Q: What does the current temperature of the radiation in the Universe T0 represent? How could we measure it? Galaxies don't like to be alone, they seem to come in groups. The Local Group of which we are a member contains around 20 galaxies (mostly dwarf ellipticals) with 3 main spirals (Milky Way, M31 Andromeda, and M33 Triangulum) all within a diameter of around 1 Mpc. The nearest large cluster is the Virgo Cluster at a distance of 17 Mpc. It contains more than 2500 galaxies (again mostly dwarfs), and has a total mass of around 10^14 Msun within a radius of 1 Mpc or so. The Virgo cluster exerts a strong gravitational force - the Local Group is moving toward Virgo at around 300 km/s. Like most larger clusters, there is a massive giant elliptical galaxy (M87) at the center of the Virgo cluster. It may have grown large by "cannibalizing" numerous dwarf galaxies that happened to fall into the center of the cluster. M87 is also a strong radio source (Virgo A) and has an active nucleus. It probably contains a supermassive (10^8 Msun) black hole. The Coma cluster at a distance of 100 Mpc has a mass of 10^15 Msun within a radius of over 1.5 Mpc. It contains a giant elliptical and a large S0 at the center. It is made up of mostly E's and S0's with few spirals. Large clusters are mostly devoid of spirals, probably due the the high frequency of close encounters with other galaxies. Our local group and the Virgo cluster seem to be part of a cluster of clusters in the shape of a roughly flattened pancake called the Local Supercluster. Surveys of galaxy redshifts out to 200 Mpc show a network of filaments and walls of galaxies surrounding empty regions called voids. The scale of these structures is approximately 100 Mpc. There may be larger structures still (supervoids? superwalls?) but current redshift survey are not "deep" enough to see more than about 200 Mpc. There are some indications that 100 Mpc is the scale of the largest structures, but we will not really know until we look! The Sloan Digital Sky Survey will give us a look on larger scales, measuring redshifts for 100 million galaxies! There appears to be a hierarchy of clustering: galaxies -> groups -> clusters -> superclusters -> walls? filaments? voids? -> ????? Current popular theories predict a large-scale structure formation scheme from the smallest to the largest scales, or bottom up. The smallest scales collapse first, then organize themselves through gravity into larger clusters and superclusters. Alternative models predict that the largest scale structures form first, then fragment into smaller subunits (like star formation in molecular clouds), or a top down scheme. This is out of favor now. The distribution of galaxies, on scales greater than 200 Mpc, appears to be the same everywhere in space. Thus, we believe the Universe is homogeneous on large scales. Furthermore, it appears the same in every direction we look, or isotropic. These two statements are called the cosmological principle: the Universe is homogeneous and isotropic on large scales. This means the all "observers" anywhere in the Universe at the same time will see the same general properties. There is no special place in the Universe (the ultimate Copernicanism)! The laws of physics are universal, they apply the same everywhere in the Universe and at all times. The laws of physics we discover based on experiments on the Earth can be applied to the Universe at large! It turns out, using universal laws of physics (Einstein's theory of Relativity in particular), the assumption of homogeneity and isotropy of the Universe restricts the possible cosmologies to a particular set. Requiring the solution to be expanding (as we observe) narrows the choices down further to the Freidmann - Robertson - Walker (FRW) solutions. These solutions of the Einstein equations for the Universe results in an unbounded Universe (no edges), either finite in volume (like the surface of a sphere) or infinite (like an infinite plane). Since the Universe is expanding, any length scale, like the average distance between galaxies, must have been smaller in the past. Extrapolation back in time of the equations gets us to a point where the distance is zero - the Universe is infinitely dense. This point is called the Big Bang, but should not be thought of as an explosion thought it was indeed very hot then. Is the Sky Dark at Night? Does the Universe extend forever? The finite speed of light c: distance = time. When you look out into the Universe, you look back in time. The expansion of the Universe: distance = redshift. The wavelength of light emitted at large distances (and early times) is increased on the way to us. Because the Universe is unbounded, and thus paths can be essentially infinite in length, you would expect if it were filled uniformly with galaxies like we see, that the sky would be bright as a star at night, because every line of sight would end at the surface of a star in the infinite distance somewhere. This like being in an infinite forest, you could never see anywhere that you didnt see a tree! This is called Olber's Paradox, because the sky appears to be pretty darn dark at night to us! So why is the sky dark at night if we think the Univese is unbounded? Well, though if we look in a particular direction, we look back in time. If the Universe had a beginning, it would be unbounded in space but bounded in time by its beginning! Thus, the sky is dark at night mostly because galaxies were formed about 15 billion years ago (about a billion years after the "beginning" of the Universe). Thus, the edge of the "forest" of galaxies is at 15 billion light-years distance! There is another effect due to the Hubble redshift from the expansion. Light emitted at great distances will be redshifted to longer wavelengths. The peak of the stellar blackbody in the visible will be redshifted to the IR or radio waves, and thus the sky could appear dark in the visible, but bright in the infrared or radio. This is a part of the solution to Olber's paradox, and as we will discover the sky is indeed bright in the microwaves! In 1929, Edwin Hubble at Mount Wilson Observatory near Los Angeles discovered the Universe was expanding uniformly. This expansion of the Universe, with velocity proportional to distance, is characteristic of a universe with uniform expansion, where the distance between any two points is increasing at the same fractional rate. This fractional rate is the Hubble constant H, in units of distance / distance per unit time (and thus velocity / distance). The customary unit is km/s per Mpc (or km/s/Mpc). The solutions to Einsteins equations give this uniform expansion due to the creation of new space between all points in the Universe! There is no necessary real velocity, it is space that is expanding. There is no explosion hurling galaxies outward from a center (there is no center from the cosmological principle). Furthermore, General Relativity stated that space-time is curved in the presence of mass (like a black hole). Thus, the space-time of the Universe is curved due to the presence of mass (like us) in it! The Universe appears to us to be very large, expanding uniformly, and on large scales approximately homogeneous and isotropic. From these observations, and using Einstein's Theory of Relativity, it turns out that there are very concrete predictions for the way the Universe evolves. Einstein, in 1917, applied his equations for gravity to the Universe. Einstein found that his equations predicted an expanding or contracting Universe, but not an unchanging one. So he added a cosmological constant to his equations so that the Universe could remain static. After Hubble discovered the expansion of the universe in 1929, Einstein called the cosmological constant his "greatest blunder". He felt he should have believed the predictions of his equations rather than succumb to prejudice based not on any solid observations. As we will see in the final lecture, we have returned to Einstein's idea of a cosmological constant in order to explain some problems in cosmology. Perhaps this wasn't a blunder after all! An expanding homogeneous and isotropic universe can be characterized by its topology, or the fundamental nature of spacetime in that universe. Relatively simple equations govern the way the Universe as a whole evolves in time. The spacetime of the Universe as a whole is curved by the presence of mass. There are three generic topologies for a homogeneous and isotropic Universe with 3 spatial dimensions, distinguished by the curvature. In two dimemsions, a sphere has positive curvature, a plane has zero curvature, and a saddle has negative curvature. Flat (zero curvature) space is also called Euclidean (actually, it is Lorentzian in spacetime, but Euclidean in space). Two parallel lines in a postitively curved space meet at two points (like two great circles on a sphere). The area of a circle is less than Pi R^2 (positive curvature), equal to Pi R^2 (flat), or greater than Pi R^2 (negative curvature). The sum of the three vertex angles of a triangle are greater than 180 degrees (positive curvature), equal to 180 degrees (flat), or less than 180 degrees (negative curvature). You would have to use very large circles or triangles to do these tests. The radius R of a comoving sphere of radius R0 now will change as the universe expands, just like the wavelength of light moving through the universe. Note that R0 = R(z)( 1 + z ) would be the wavelength seen now, given the true emitted wavelength R(z) then, thus the redshift. The scale factor of the Universe was higher in the past (since redshifts are positive), thus things were closer together. For small redshifts, the distance redshift relation becomes: d = v / H = c z / H since z is approximately v/c. >This is true for any curvature Universe on small enough scales, since it just involves the local expansion rate. Because the laws of physics are mathematical, two systems that follow similar laws will behave similarly. Setting E=0 gives us a universe that will just slow down to v=0 at R=infinity. If the universe has an average mass density equal to the critical density, it is a flat universe with zero curvature, infinite volume, and expands forever though slowing down to zero infinitely far in the future. If the universe has less than the critical density, it is an open universe with negative curvature, is infinite, and will expand forever. If the universe has greater than the critical density, it is a closed universe with positive curvature, has finite volume, and will expand to a maximum scale factor at some time in the future, then will recollapse. For the HST value of H=82 km/s/Mpc, the critical density is 1.26 x 10^-26 kg/m^3. Astronomical measurements give an average mass density of the Universe somewhere in the range between 10% of to just over the critical density. If we live in a Universe that is expanding with mass in it, the expansion is slowing down. Thus, the Hubble constant H was higher in the past. We denote the current value, which we measure, as H0. H0 as measured by HST is 82 km/s/Mpc. A universe with higher density is younger than a universe with lower density, given the same expansion rate H0 now. 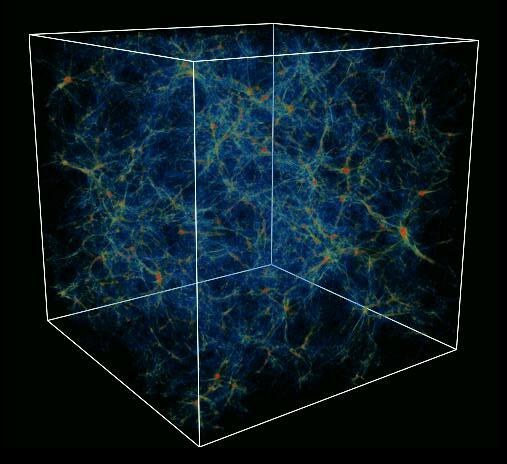 For H0=50 km/s/Mpc, the age of an empty universe would be about 20 billion years. For a flat universe, the age would be 13 billion years. The oldest globular clusters appear to be 15 to 18 billion years old, while the Sun is around 4.5 billion years old. If H0 is really as high as 82 km/s/Mpc, and the Universe were flat, then the Universe would be younger than its oldest stars, which is nonsensical. A value of H0 larger than 50 km/s/Mpc implies an open Universe (or does it)?